Praying Mantis – A Word For The Church | Reflection of Glory! As I was washing a load of clothes, I walked past my laundry basket that I use for dirty towels. 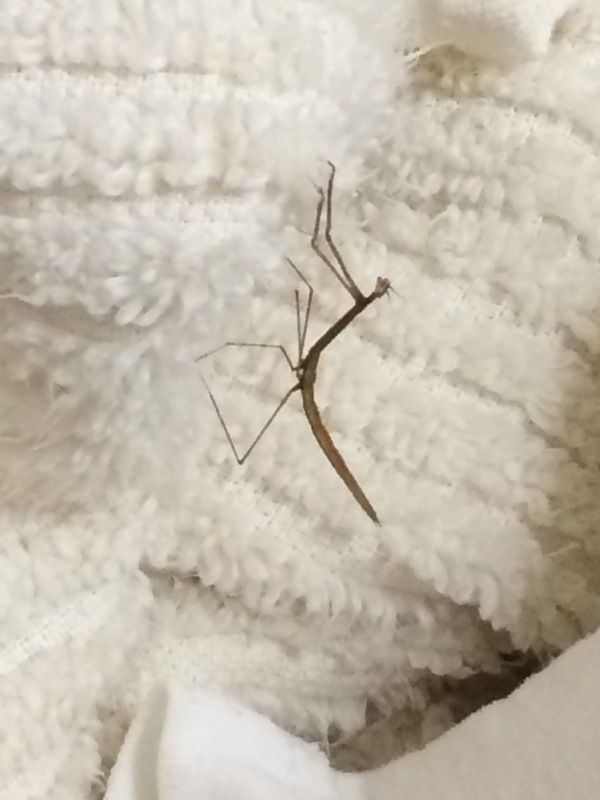 And there perched motionless on a towel was a baby praying mantis! As I continued watching, it slowly started moving. I transported it gently outside where it needs to be for life!! As I was thinking about it later, I started feeling that there was a prophetic meaning to this. However, I didn’t really seek the Lord about it immediately. I usually am not slow in putting to paper what I feel the Lord is saying through a circumstance in my life. The Lord used a dear friend to give me a little push through a comment he made! As I began praying about this, I felt led to look up some facts about this insect. And as I began to look up the characteristics…I began to get revelation of what I believe the Lord is saying to His Church. What I saw was definitely a baby. I believe we are in the beginning of a new season of prophetic intercession. We will begin to see a new level of intercession beginning to spread throughout the body of Christ. I sensed the “baby” was referring to the beginnings of this happening…not that it was immature. On the contrary – it will be stronger, more intense, and definitely will grow quickly! The praying mantis was sitting on top of a pile of dirty towels. These towels were getting ready to be cleaned and washed. In John 13:4-5, Jesus humbly prepared Himself for ministry (washing the disciples feet) by wrapping a towel around Himself. As He washed His disciples’ feet, He dried them with the towel. I believe we are being called to look at our “towels”…what we are “clothed in” for ministry…and see if it needs to be cleansed! And we are to make sure we are ready to humbly get on our knees for the sake of others! These insects can turn their heads 180 degrees to scan their surroundings with two large compound eyes and three other simple eyes located between them. I believe the five eyes symbolizes the five-fold ministry of the Church. As the Apostles, Prophets, Evangelists, Pastors, and Teachers come together in unity…the Lord will use each of the ministries to work together to bring about His Vision for His body. They will be able to “see” with greater clarity what is coming and be able to work together to prepare the Church…through declaration, decree, teaching, and prophetic intercession. Praying Mantis are well camouflaged on the plants among which they live. We, as prophetic intercessors, will be able to move within the communities and cities in which we live under the covering of Almighty God! I believe we will not be “camouflaged” in the sense of not being seen by others…but in the sense of not being seen by the enemy of our souls – Satan. We will have supernatural protection to move in power and authority in the kingdom of God. Hallelujah!! Finally, it was interesting when I came across the meaning of Mantis in the Greek. It means prophet or seer!! Praying Prophet!! I like that! So, dear Brothers and Sisters, I know this is a lot – it really ended up being more than I was anticipating. But, I have written down what I believe the Lord is saying. And, as usual, I encourage you to not just accept everything that I have placed before you…but to seek God’s confirmation on the truth of it. Blessed be the name of the Lord!! ← I Raise My Hands To You, Oh God!